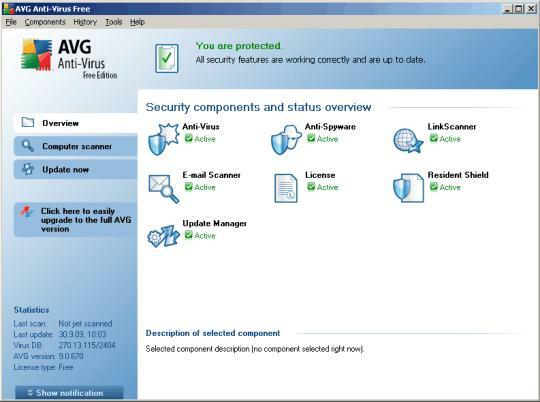 AVG Free is one of the oldest and most used freeware antivirus solutions, not by far perfect but enough for savvy Windows users. You get a combined antivirus and antimalware engine, Link Scanner, and e-mail scanning. AVG Free 9 adds a few new features, with enhancements focused on performance, promising faster scan and boot times. The best novelty is the Identity Theft Recovery Unit. Unfortunately is catering for nowÂ only to users in the United States and is a business partnership with Identity Guard which provides â€œconsumer identity theft solutions,â€ accessibleÂ from the AVG toolbar in Firefox and IE. The interface is almost identicall with the last version, andÂ itâ€™s easy to use as before. However, you must double-click to get more information on features, that could be made in one click easy enough. You have a scheduler utility that automates both scans and updates, while the upgrade ad at the screenâ€™s bottom can be easily hidden using the Hide Notification button. You have 3 settings for scans: Slow, Automatic, and Fast scans: the faster the scan, the less comprehensive it is, so you might wanna take advantage of the scan optimization that is recommended during installation to speed up that first scan. What is missing is a a progress meter for regular scans. Also you can create a rescue disk usefull for scans outside the windows enviroment if the situation requires it. It is still one of the bests freeware antivirus solutions out there and if you’re willing to pass a few nags you’re good to go. Posted in	System utilities. Tagged with	Anti Virus, anti virus freeware, antivirus avg, antivirus solutions, avg antivirus dld, avg antivirus freeware, avg antivirus9download, avg free, avg9 tips, coffee mugs, company incorporation, e mail, Freeware, freeware antivirus, freeware avg 9 download, freeware avg download, freeware program, Freeware Software, identity guard, mail free, notification button, softonic.